Visiting aircraft are welcome but call first as the airfield is PPO. To enhance technical training for invited students, the club have initiated a free on-line classroom. Student pilots embarking on a pilot training course are invited to join this scheme. The object is to help students and answer any technical queries they may have as they progress through their training. In addition "online classroom" students will have access to a wealth of additional information via the sites' comprehensive web pages. Students and pilots at all stages of training and experience will find this useful but in particular candidates who are studying for PPL examinations can greatly benefit by using this facility. All that is required to register is to send us an e-mail stating that you wish to join NOK's virtual classroom. You will receive confirmation, via email, together with user name and password. NOK will confirm your status as a registered NOK student and introduce the "virtual" classroom. * Note: only NOK Flying Club members are eligible to join this scheme. Welcome to our free live online classroom. Send us your queries or comments and our instructor team will attempt to answer promptly. As a pilot you will probably find that there are some areas of both your technical and flying training that need further explanation. If you have any questions/queries or points relating to your flying/ground training programme then post your message here. 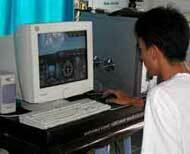 This site contains a wealth of useful information for those pilots studying for Thai PPL/CPL/ATPL.